A transportation pioneer will help Red River College train the next generation of industry achievers, and ensure the viability of Manitoba’s skilled workforce for decades to come. 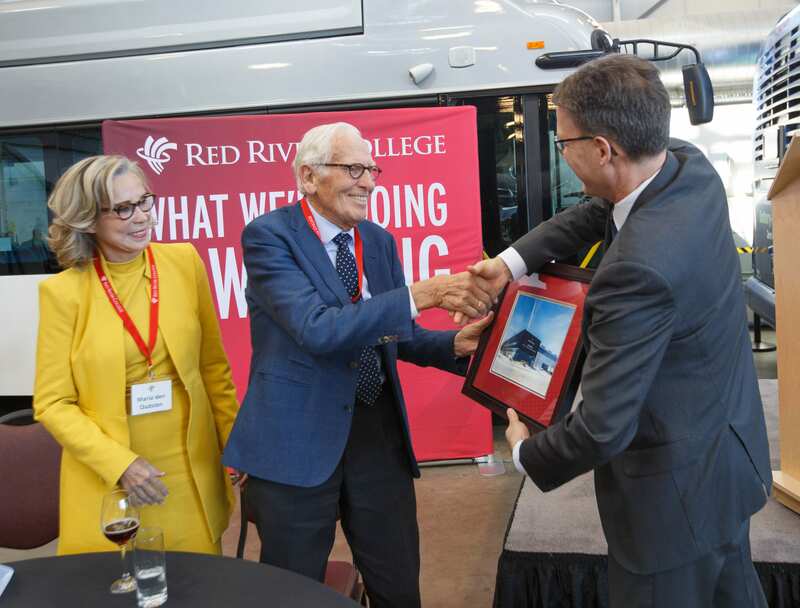 Jan den Oudsten — founder and former president of New Flyer Industries, and inventor of leading-edge transit technology — along with his wife, Maria den Oudsten, is donating $1.5 million to RRC, one of the largest gifts the College has ever received from individual donors. RRC is celebrating the transformative gift by officially renaming its Heavy Equipment Transportation Centre. 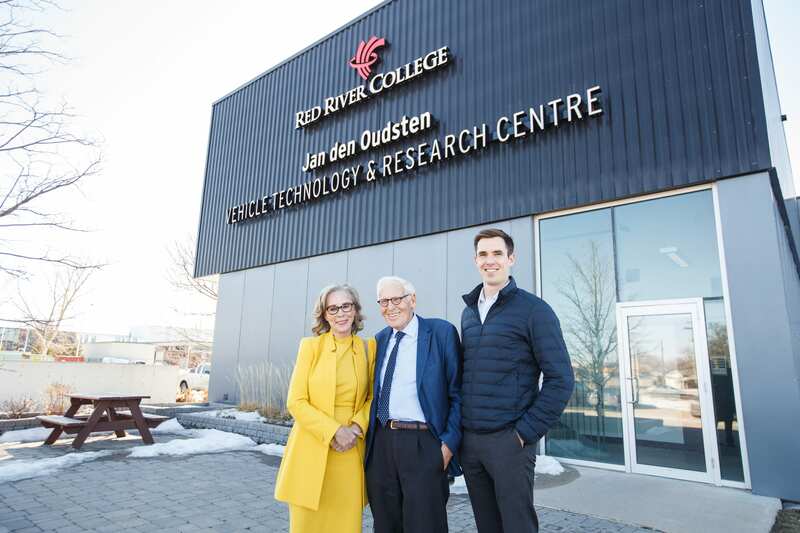 The 60,000-sq.-ft. training and research facility will now be proudly known as the Jan den Oudsten Vehicle Technology & Research Centre (VTRC). The expansive complex was built in 2008, and was one of the first education centres in Manitoba to receive LEED® Silver certification from the Canada Green Building Council. Every day, close to 170 students at VTRC are trained in transportation technology programs such as Heavy Duty Mechanic, Truck Transport Mechanic (apprenticeship), Trailer Mechanic (apprenticeship), Outdoor Power Equipment (certificate and apprenticeship) and specialized training for General Motors. VTRC also works with industry partners such as New Flyer to drive applied research in vehicle technology and development, and to support the transportation industry on energy conservation and alternatives (such as electrification), cold-weather testing and technology integration. This work is expanding with the construction of MotiveLab™, a 7,000-sq.-ft. research facility that will support Manitoba’s heavy vehicle sector, including transit. MotiveLab™ contains a climatic chamber with the ability to test vehicles in extreme weather conditions — from -40C to +50C — while under full load conditions. “On behalf of Red River College I am so grateful and honoured that the den Oudstens chose to support the College through this impactful gift. Their generosity will benefit thousands of students every year by enabling the College to build and upgrade its state-of-the-art facilities with cutting edge equipment,” says RRC President Paul Vogt. Den Oudsten’s contributions to the vehicle research sector have made a significant impact around the world over his 50 years of service. He purchased New Flyer in 1986 and introduced his vision for European-style accessible low-floor technology to the North American transit market, ensuring all passengers — including those with significant mobility challenges — are able to travel using regular transit services in cities across the continent. Den Oudsten was also involved in pioneering hydrogen fuel cell technology applications, and was the first to introduce a 60-foot articulated diesel-electric hybrid bus. In 1999, he unveiled the Invero, New Flyer’s state-of-the-art transit bus design. Under his leadership, New Flyer expanded to over 2,000 employees. Today, the company has more than 44,000 buses in service, just over 7,300 of which are electric powered and 1,600 of which are zero-emission. On Thu., March 21, den Oudsten will also be recognized and honoured with the 2019 Pioneer Award from the Canadian Manufacturers & Exporters – Manitoba.